Madison, my energetic 10 year old daughter, is back again with another report about her favorite parts of Disney World. This time she writes about Epcot's Biergarten Restaurant. Are you having a hard time picking where to dine at Disney World? Are you looking for a place where you can take in food, drinks, culture, and maybe a little music and dancing? Well, if you are then you should head to Epcot's Biergarten Restaurant located in the Germany section of the World Showcase. Don't worry it is definitely not a pub or a bar. It has a wonderfully joyful atmosphere. Hey, I'm 10 and I knew when I was 9 that I was tired of restaurants that basically only serve Chicken Nuggets to kids and give them fancy names to make you believe they are extra special. Fortunately, I don't have to worry about that here. The Biergarten is a buffet, so they still have wonderful macaroni and cheese and normal kid food, but you can also try a little German food like the Schnitzel and Spaetzle. It is really good! Now on to the culture, music, and dancing! Well for culture it really does seem like you're in a German town with the buildings and the waterwheel that you see in the large open area that makes up this restaurant. All the kids stop eating dinner and go down to the dance floor with some adults joining in. People just like you start dancing and have a lot of fun moving to the beat of the traditional German music. Try a polka or maybe the Chicken Dance. It is definitely a lot more fun if you join in, so don't just sit and watch, get up and dance. You are on vacation remember! 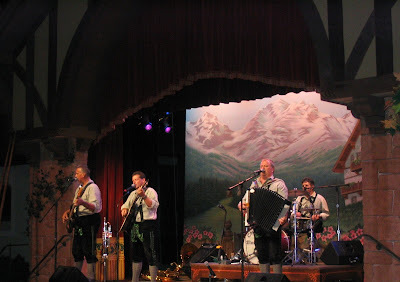 I hope this article influences you to try the Biergarten on your next Disney World visit. That's my Kid's Eye View. Enjoy this clip from the Biergarten. Bye for now. 0 comments to "Kid's Eye View - Epcot's Biergarten Restaurant"